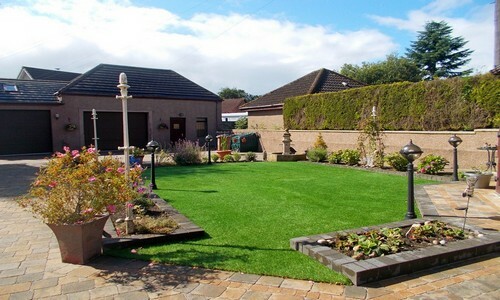 Artificial Turf Scotland - leading suppliers of artificial grass across Scotland. At Artificial Turf Scotland we are one of the leading suppliers of artificial grass for domestic and commercial use throughout Scotland. We take pride in providing a fully comprehensive service by offering free estimates, an unrivalled turnaround speed and a ten year guarantee on all artificial grass installations. With more than a decades industry, Artificial Turf Scotland have established a strong reputation for providing our clients with fantastic surfaces and a great service whilst maintaining our price promise, beating any like for like quote. Through extensive research and development we are able to offer a safe, first class alternative to real grass. We stock a wide variety of grasses which are specifically tailored to suit each and every garden. Our range of artificial turf includes child and pet friendly ranges where safety and durability are our number one priority. Artificial grass is the perfect alternative for your garden as it allows you to be in complete control of the look and feel of your grass. Having our artificial turf installed will make you the envy of many of your friends and neighbours with luxurious green grass all year round, and once it is installed our fake grass is virtually maintenance free which means you can forget about muddy grass, lawn mowers and irrigation systems. At your design consultation our installers will provide you with friendly, honest recommendations based on your requirements. We will also take measurements of your garden which allows us to provide you with a true quote. We also guarantee never to be beaten on price or quality therefore we guarantee to beat any like for like quote. Once you have approved the quote and at a time that suits you our experts will begin work to transform your garden. Our installers work quickly and professionally in order to minimise distribution to your home. It is time to sit back and enjoy your garden. All our work is carried out to the highest standard however in the rare case there is an issue all our installations come with a 10 year guarantee for your piece of mind.